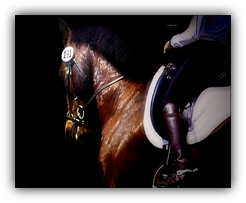 Meeting your needs for great service and responsible horsemanship. All pictures and text Copyright Bevin Allison or Kent Spieker. AboveParr Equestrian - Bevin Allison received an award for their commitment to SAFETY in 2007 and 2008! Click on one of the photos on the left to see a larger version of them. Why be par? When you can be AboveParr! That's right! Using the AboveParr training and instruction methods developed by Bevin Allison numerous horses and riders have reached their goals and you can too. Bevin's main focus is in Dressage helping beginners, riders looking to switch disciplines, or those looking to enhance their riding performance in other disciplines with foundation work using her AboveParr methodology! She has numerous testimonials to support her results. She also offers a 360 degree customer service policy and treats all her students and horses fairly and understandingly. Bevin also offers a choice in lesson and training options from half hour to 1 hour. From single lessons to package deals. Plus, unlike other Dressage specialists, she takes debit and credit cards! Now isn't that convenient? So what are you waiting for? Call her or email her today for your free first 30 minute lesson and see what AboveParr can do for you! Check out the NEW Resources and Education page by clicking here!